* One-time startup charges: $14.95 shipping fee; $50 refundable deposit applies if rental option. 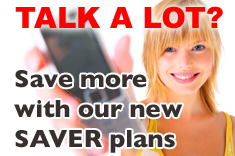 * $2.95 per month network access fee applies to enable long distance calling. * For service packages WITH CONTRACT, $50 cancellation fee applies if you cancel after the first free month and before 1 year. © 2009 VoIP Hiway. All rights reserved.